Two months ago I made the first block for a quilt along I’d begun. I saw the second block and got cold feet. 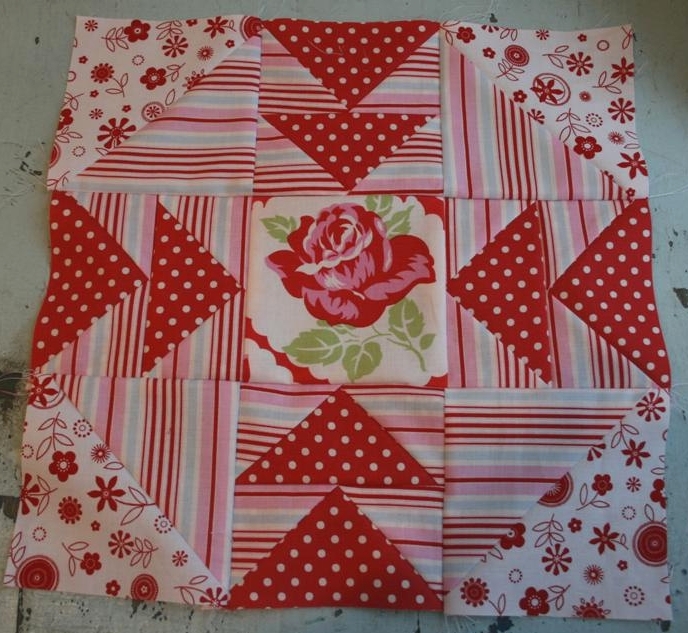 The block is great; I just wasn’t confident it would work well with the fabric I’m using. A couple of weeks later I checked back and saw another block that I wasn’t sure I wanted to make with this fabric. Cold feet once more. And so my lone completed block has sat, for two months, on top of a pile of neatly folded fabric, looking at me every time I walk into my studio. How’s that for being a finisher? I know, disgusting. 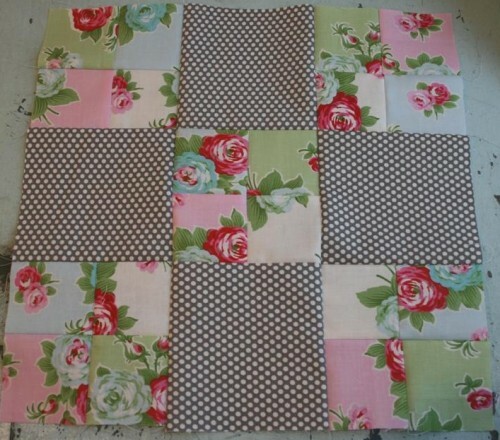 Well, all the blocks are now available and the layout of the quilt has also been unveiled. I’ve decided to finish the quilt. I’m going to make 14 of the blocks, skipping the two I was unsure of. Once they’re all made I’ll decide what to do; either make the blocks I’m hesitant about, choose two favorite block designs and make duplicates in different colors, or design something different. I’ll work it out when I’ve got the remaining blocks complete. This block was a lot of fun to make and came together much more quickly than I anticipated. I learned a new technique for making flying geese which was kind of fun. 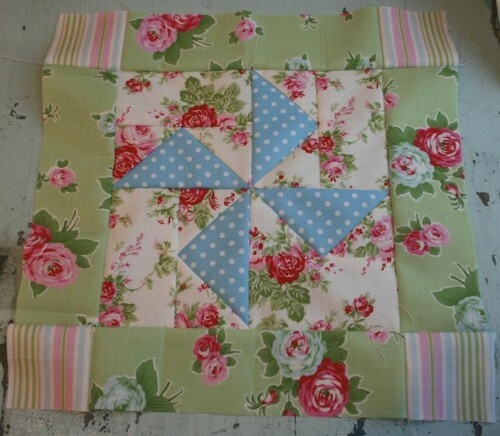 I’m not sure I’m smart enough to figure out the math well enough to design or cut a quilt using the technique, but I’d really like to learn. This block I changed a bit. The design is supposed to have the red polka dot in the center, but I wanted to incorporate one of the large red roses so I swapped it in. I’m not sure about this block, but my three year old princess likes it best. This block was a lot of fun to make. I enjoyed using the same print in four colorways for the patchwork squares. The dark gray polka dot is from the Summertime collection. I’ve used this gray dot to bind a quilt with and it’s one of my current favorites. This pinwheel block might be my favorite. I really like pinwheels and I love the way the blue really pops. So pretty. 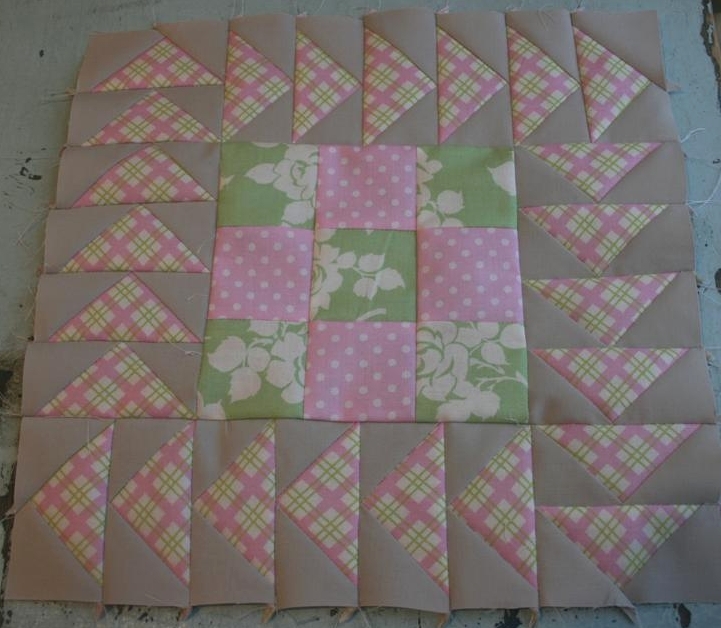 Now five blocks are complete and I only have 11 more to make! (so much for my grand plans to stay caught up). I’m hoping to complete them quickly and see how the project turns out. My fav is the one with the gray polka dots. I finally finished cutting the strips for the postage stamp quilt, that’s how far behind I am. I love the red one. I like how you put the rose in the center with the polka dots leading to it.